This is the only bar which still has its medieval barbican and which seems to show the scars of military attacks on it; one place you can see both from is the pavement at the bottom of the steps off the Walls, north of the bar. The blank wall of the barbican runs out to your left, running out from the main bar building above and in front of you. If you look carefully at the bottom 2 courses of stone you’ll see a crack and dip in them about a third of the way along the barbican’s wall, this is thought to be the result of a mine dug under the bar in an attack in 1644 during the English Civil War [more details are in the story for this bit of the trail]. The trail continues by crossing the road at the traffic lights to your right. After crossing the road the steps up to the next section of the Walls are ahead of you but before reaching them you can look left, down through the bar’s archway, to the roofless passage of its barbican. It was this passage that was the defence provided by the barbican, if attackers broke through the gate that would have closed the far end of the barbican, they would come into this passage [or “killing ground”] surrounded on all sides by manned walls above them as they continued towards the bar’s portcullis and main gate [there are old wooden gates close on either side of you]. At the steps up to the next section of the Walls, turn back to the bar to see the extension to its living space that was added to the bar at the time of Queen Elizabeth I –there is a café you can visit there. 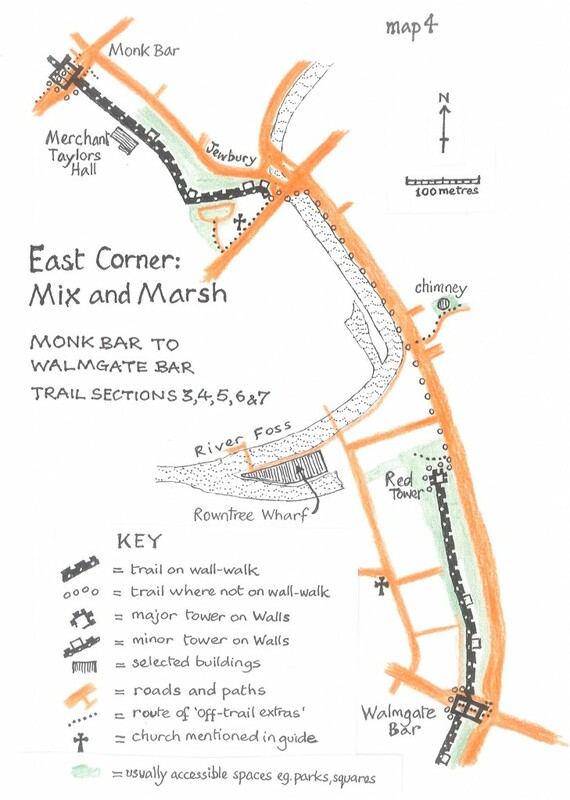 The same steps go to the café and to the next corner of the trail [with an excellent view back to the bar]. Most of the details of this bar are best given in two very short-distance off-trail extras but it is worth mentioning a possible link between all the modern building next to this bar and the survival of the barbican. In mid-Victorian times the councillor elected to represent this area [one of the Rowntree family] claimed that the council had failed to remove the barbican and improve the roads in this area because the people living in it were so poor they were thought not to matter. He wanted the barbican and the Walls in this area to be knocked down to bring more space and cleaner air –but the Lord Mayor said he wouldn’t want to be the man who lost the Walls their last barbican. Poor housing conditions around here were finally dealt with in the next century by the council’s buying homes in order to demolish them and build new ones –this was called “slum-clearance”. From the back of the bar, go under the Elizabethan upstairs extension, past the great oak doors [probably 15th century], noticing the little wicket-gate within the main door on your left, go under the portcullis spikes noticing the groove for the portcullis to slide down in –and enter the “killing ground” mentioned in “basics”. Go through this, turn left and look immediately at the outside face of this, the front wall of the barbican. At waist height, almost exactly in the middle of the wall, you should be able to see what looks like the result of a cannon ball from the east hitting the stone work: a hollow with radiating cracks; some authorities say that this is the result of the 1644 bombardment. 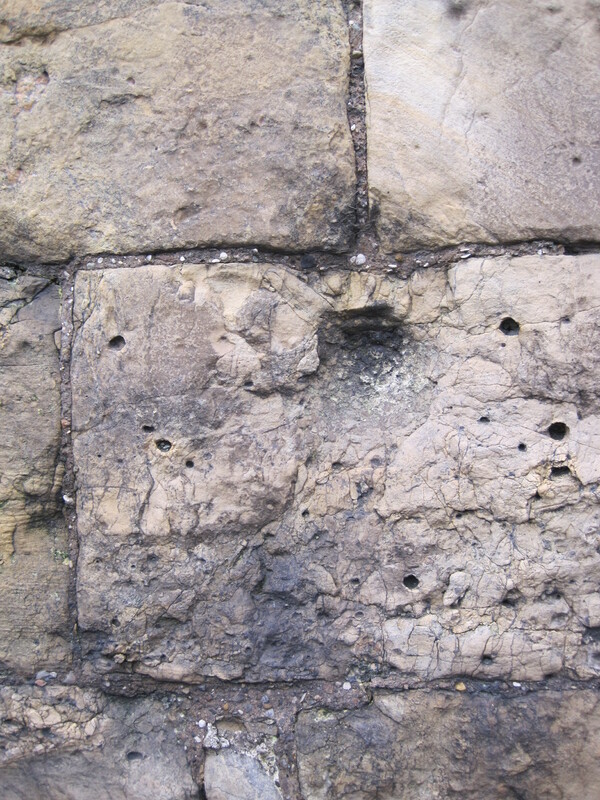 The same stone has much smaller hollows that look as if they could be caused by musket balls but there are many more of these to be seen if you carry on round the corner a couple of metres and look up at the right hand corner-turret of the main bar, looking especially at the stones 7 to 12 courses directly below the little window. Again opinion seems divided, some thinking that all the hollows are caused by natural weathering. A few metres further and you are next to the dip [in the lowest courses of stone-work] that is mentioned in “basics”. Your best way back to the trail is now to retrace your steps. The carving above the gateway where you re-enter the barbican could once be read as recording [below the city’s coat of arms] that the barbican was restored in 1648 after its near destruction in the Civil War. The carving above the archway of the bar commemorates a later restoration and is below a shield with a medieval royal coat arms. Above the arch the rooms of Walmgate Bar are occupied by a small, church-run café; this, though sometimes student-filled, is a special visual treat [usually open 10.00 -6.00, not Sundays, phone 01904 464050, it’s “gatehousecoffee” on Facebook]. Remember there is an upstairs worth visiting and, though they do not advertise them, the barbican, portcullis and toilet are behind the counter-bar downstairs –so ask. The door to the barbican wall-walk is to the left in the wall behind the counter-bar; the portcullis is like heavy trellis shelving disappearing behind cupboards at the back of the counter-bar; the toilet [–though not itself medieval!] is attractively fitted into medieval walling at the right. These rooms were probably ruined by parliamentary cannon bombardment in 1644 and then repaired by 1648 using money parliament confiscated from royalist supporters. 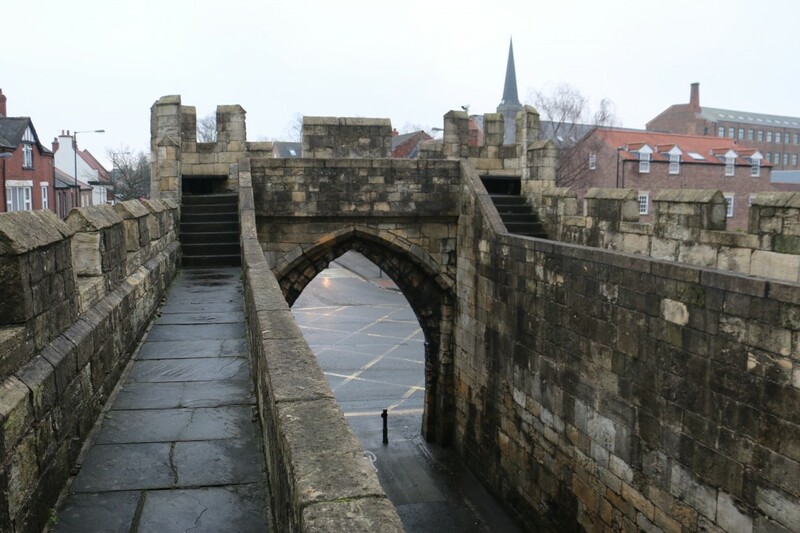 The last time that the Walls were attacked was also the only time that York has been besieged with armies circling the city. This was in 1644 during the English Civil War between forces loyal to the King and those supporting a parliament which wanted to limit the King’s powers. 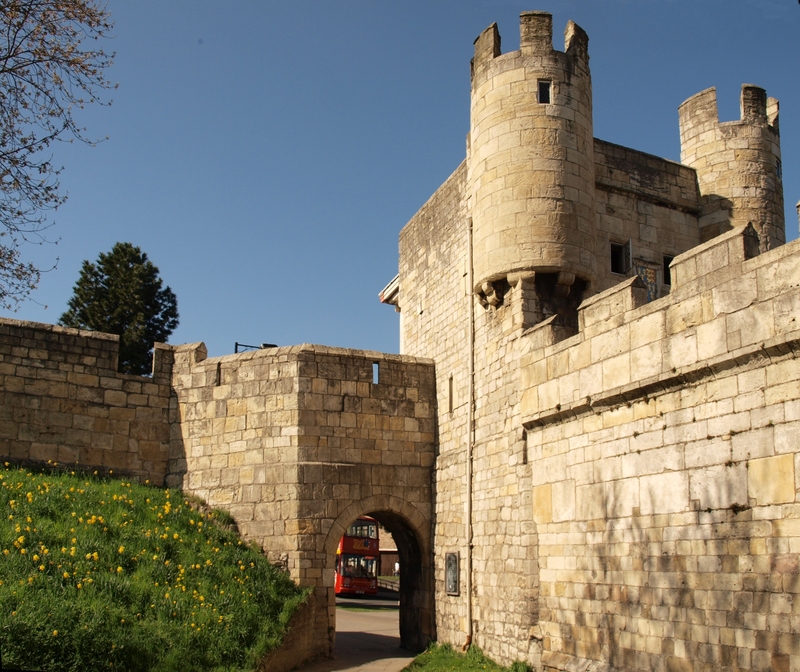 The Walls and bars were three or four hundred years old at this time and gunpowder and large cannon had made them much less of a protection than they had been in the Middle Ages but the King moved an army into York, personally inspected the old defences and arranged for them to be strengthened. 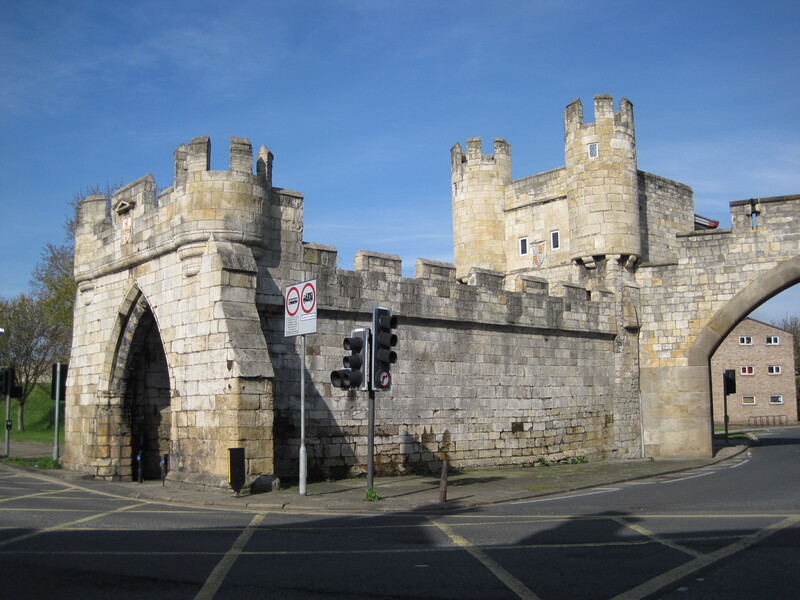 Parliament’s supporters in York and Yorkshire created their own army and in the summer of 1644 this was outside this Walmgate section of the Walls and had been joined by a Scots army on the south side of the city and another parliamentarian army on the north side. A large cannon [firing 25 kilo cannonballs] was dragged to Heslington Hill, outside the city, 200 metres east of Walmgate Bar; this exchanged fire with cannon mounted on Clifford’s Tower, half a kilometre west of the Bar. St Sampson’s, a church in the centre of York, was hit -though it is said that Lord Fairfax, in command of the Yorkshire parliamentarians, threatened death to any of his soldiers who damaged the Minster with their fire. 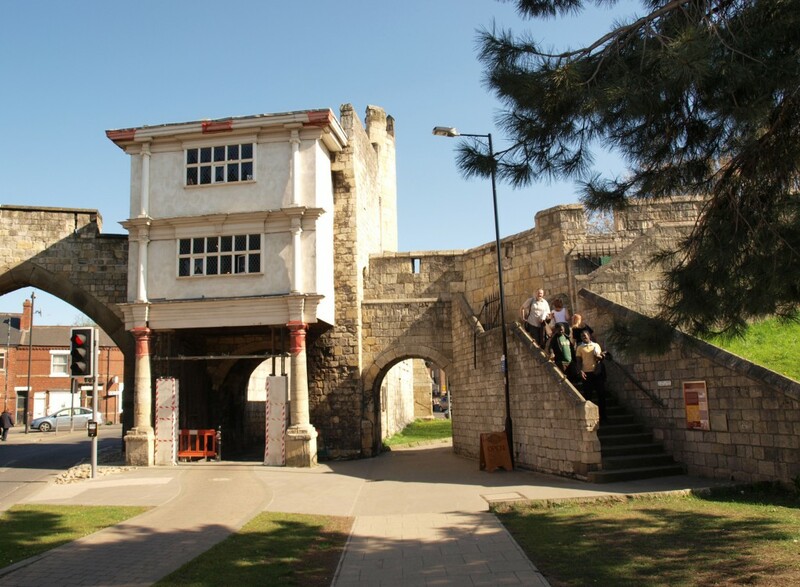 Walmgate Bar was badly damaged by cannon fire but it also came under secret attack from below ground. Parliamentarian forces were digging a tunnel, it was probably planned to go under the bar itself, to be filled with gun powder and blown up so that the bar fell in ruins. 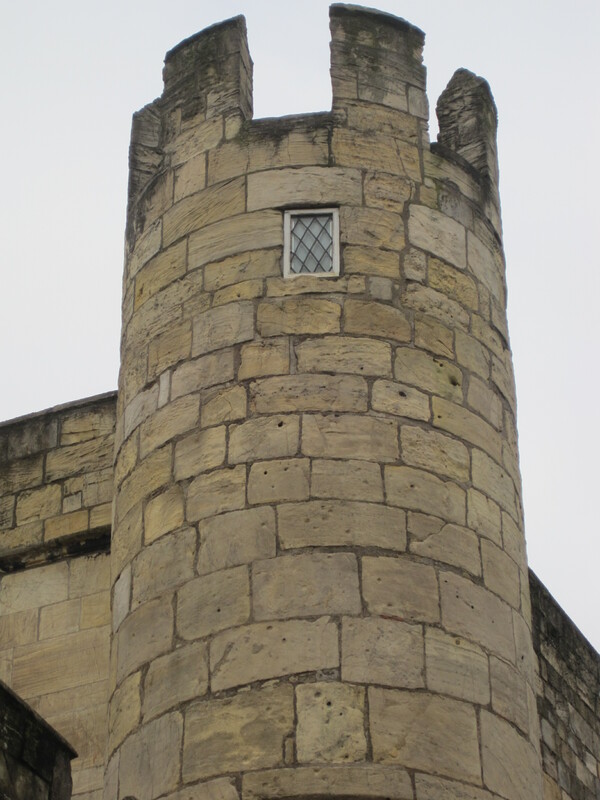 Over the other side of York, St Mary’s Tower lost a wall this way [and was then stormed by attacking troops who were only forced back by fierce hand-to-hand fighting]. Perhaps the defenders were suspicious that something like this was planned, in any case they captured a parliamentarian soldier, questioned him and learned that the undermining at Walmgate Bar was nearly complete. The defenders quickly dug a shallow tunnel of their own to cross above the route of the attackers’ tunnel, then they flooded their shallow tunnel with water, this flooded the attackers tunnel too so that it was abandoned. The Walls were actively defended like this till Prince Rupert arrived with a Royalist army to relieve York; then there was a big battle just west of the city on Marston Moor. The Royalists were defeated in this battle and so gave up hopes of being able to hold York -they negotiated a surrender that allowed the Royalist soldiers to leave York with their weapons and promised that many of the parliamentarian troops who would take their place would be Yorkshiremen. 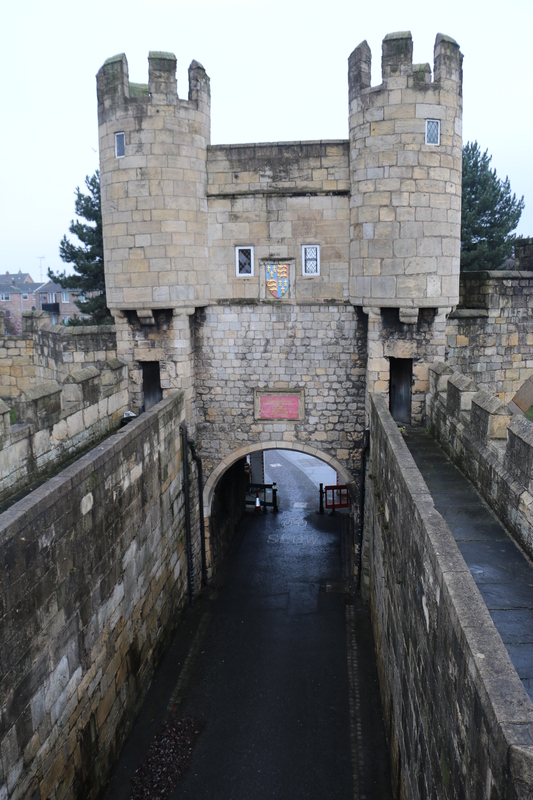 The parliamentarians thought they needed to be able to defend York so they quickly repaired the Walls, but in fact what the King and Prince Rupert feared would happen did happen: the loss of York led quickly to the loss of the north of England and that led to the loss of the Civil War. King Charles I kept scheming for victory even when he was imprisoned so he was executed. For eleven years England was ruled without a king. 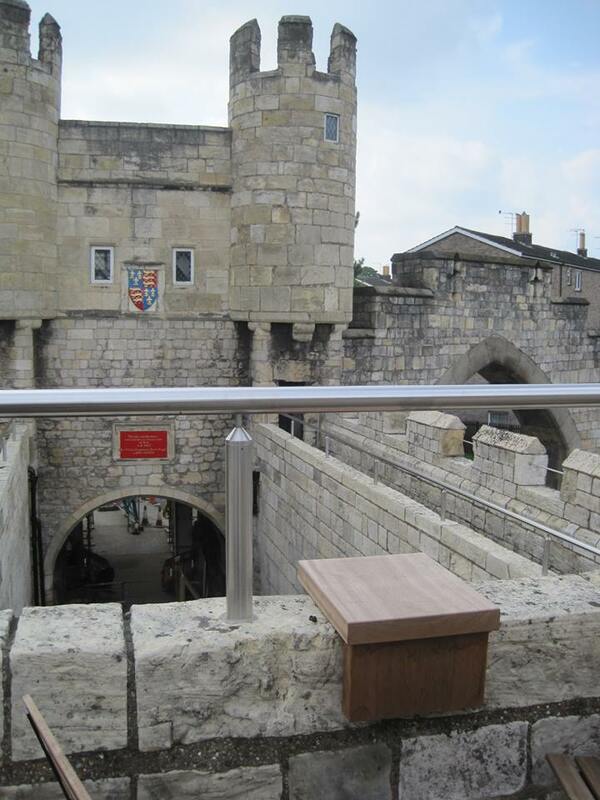 The wall-walk around the barbican at Walmgate has been repaired and fitted with safety rails so now has a few chairs and tables for use by those visiting the café there. 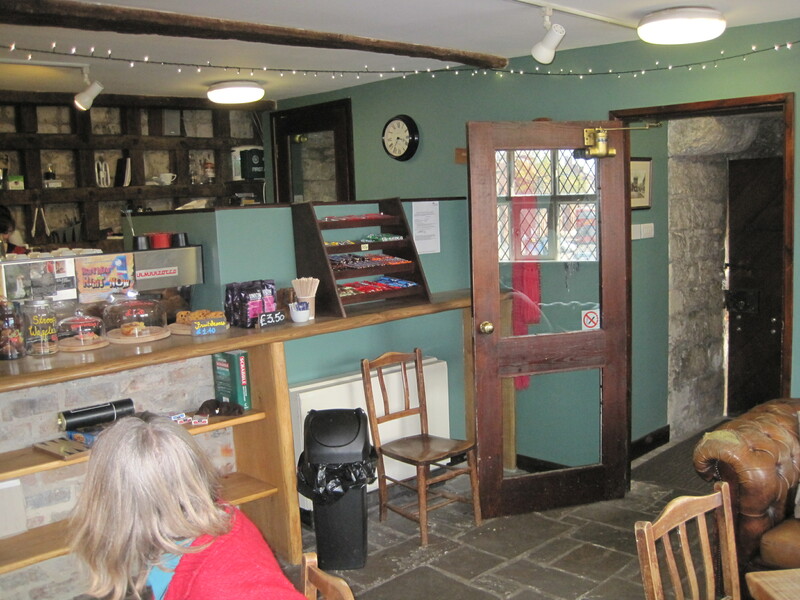 The café continued to be open while repair and restoration work at Walmgate Bar continued. Roof views are now available from the top of the bar.